Atkinson, James. Arghandi (Afghanistan). Guns Surrendered by Dost Muhammad Khan in Centre Secured by Major Cureton and His Lancers. 1839. Courtesy of the British Library Board, London. Atkinson, James. Surrender of Dost Mohommed Khan, to Sir William Hay Macnaghten Bart, at the Entrance into Caubul from Killa-Kazee. 1842. Courtesy of the British Library Board, London. Butler, Elizabeth. The Remnants of an Army. 1879. Tate Collection, London. Eden, Emily. Dost Mahomed Khan and Part of His Family: Mahomed Akram Khan, Hyder Khan, Abdool Ghunee Khan. 1844. Courtesy of the British Library Board, London. Qeran, Baba. Naghne Danbora. Radio-Television Afghanistan. Rattray, Lieutenant James. Afghaun Foot Soldiers in Their Winter Dress, with Entrance to the Valley of Urgundeh. 1848. Courtesy of the British Library Board, London. Rattray, Lieutenant James. Bala Hissar and City of Caubul with the British Cantonments from the 'Ba Maroo' Hill (detail). 1848. Courtesy of the British Library Board, London. Rattray, Lieutenant James. Dost Mahommed, King of Caubul, and His Youngest Son. 1848. Courtesy of the British Library Board, London. Rattray, Lieutenant James. Encampment of the Kandahar Army, under General Nott. 1848. Courtesy of the British Library Board, London. Rattray, Lieutenant James. Interior of the City of Kandahar, from the House of Sirdar Meer Dil Khaun. 1848. Courtesy of the British Library Board, London. Rattray, Lieutenant James. Interior of the Palace of Shauh Shujah Ool Moolk, Late King of Cabul. 1848. Courtesy of the British Library Board, London. Rattray, Lieutenant James. Jugdelluk, the Last Stand Made by General Elphinstone's Army in the Calamitous Retreat. 1848. Courtesy of the British Library Board, London. Salter, William. William Elphinstone. 1836-39. National Portrait Gallery, London. Vigne, Godfrey Thomas. `Abdul Samud - Persian General in Dost Mohd.s. Service Kabul' 1836. Victoria and Albert Museum, London. Vigne, Godfrey Thomas. Dost Md Khan Taken at Kabul. 1835-38. Victoria and Albert Museum, London. In 1837, British presence in Afghanistan amounted to a handful of diplomats. By 1841, British presence ballooned to 16,000 military personnel. By 1842, only 1 British soldier survived. By the 1830s, the Great Game between Tsarist Russia and Imperial Britain had begun. 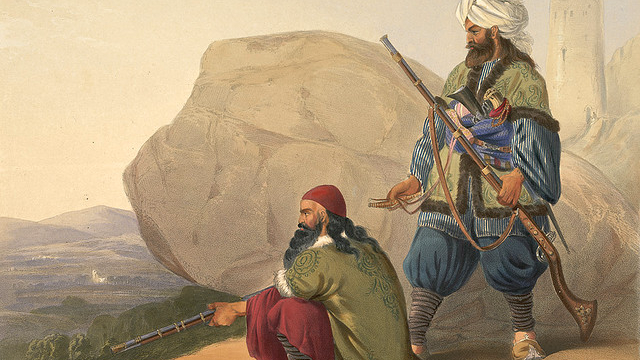 In Afghanistan, Dost Mohammed—the Emir of Kabul—was facing attacks by the Sikhs, and he was struggling to hold onto his power. In 1837, he sent a letter to the British in India and asked them to support him against their mutual enemy. Britain, eager to turn Afghanistan into a buffer against Russia, responded by saying that they’d protect him only if he cut off all relations with the Russians. But the British never put the agreement in writing, so Dost Mohammed, desperate to defend against a Sikh attack, turned to the Russians for help. The British, furious, decided to cross the Khyber Pass with troops. They hoped to bring down Dost Mohammed in order to prop up their own man—Shuja Shah—the exiled leader who was eager to be reinstalled, even if it meant being nothing more than a puppet of the British. When the British troops arrived, Dost Mohammed knew he would quickly be deposed. He fled into the hills while the British took Kabul with ease. They propped up Shuja Shah and they continued to pacify locals with bribes. The British assumed their mission had succeeded and they began to feel all too safe in Afghanistan. The commanders allowed their soldiers, many of whom were Indian, to invite their families and soon the British presence in Afghanistan numbered in the thousands. But the calm would not last for long. In 1841, multiple British officers were assassinated by locals, and supplies were sacked. By winter, it was clear to the British that they were unwanted and that they should retreat before things got worse. They negotiated a safe passage to India for a party of 16,000 troops, personnel, and family members. They began their retreat in January 1842, led by William Elphinstone. But Akbar Khan, the proud son of Dost Mohammed, had been hiding in the hills gathering a massive army of supporters and waiting for the day when he could avenge his father’s defeat. His soldiers attacked the British party relentlessly. Of the 16,000 people in Elphinstone’s party, only 40 survived. Only one of those men was British. In January of 1842, the Afghans showed the world that they would be players rather than pawns in their country’s affairs. Tensions ran high, militaries were assembled, and the first shot was fired. One side suffered a devastating and humbling defeat.